Who is up for a little reading? I have the very start of an idea forming, and I need your help tying this whole concept together into a pretty little bow. 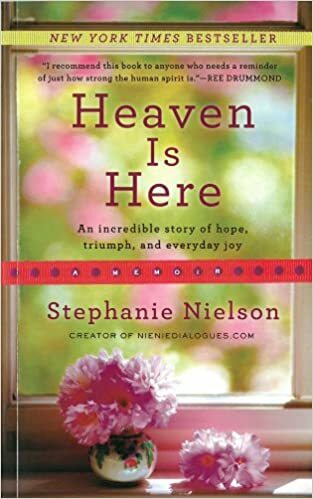 I'm currently about halfway through Heaven Is Here (by Stephanie Nielsen, blogger behind nieniedialogues.com, who survived a small plane crash along with her husband and tells the tale of that journey). I'm enjoying it so much. Stephanie's blog was one of the first that I ever read. Our lives did not have a lot of similarities, but I was captivated by her perseverance and strong, active love for her family. She writes beautifully, and I have been reading every night before bed (and sometimes sneaking in a few pages during Camille's naptime). I'm hoping to have lots of time to read this weekend -- 100% chance of rain! -- so am aiming to wrap it up soon. Leading me to the question, what next? I read the other day that our local library is hosting a Community Read initiative, where they invite community members to all read the same book and engage with each other about what was read. 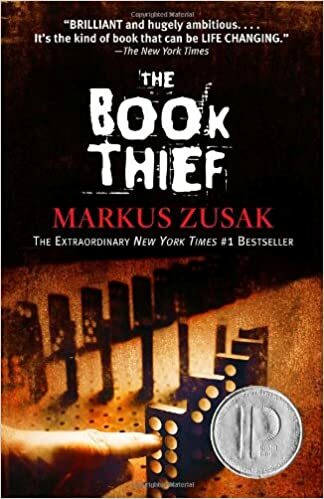 I was really excited to see that one of the titles they chose was The Book Thief by Markus Zusak. It was chosen for their teen/young adult category, but I have talked to plenty of adults who have absolutely raved about this book. It's been on my "must be read" list for a while. I have decided that The Book Thief will be my next read, and I'd love to find a way to engage with you if you'd like to read it along with me (and many of Charlotte, NC's library patrons!). Here's where I need some ideas ... how could we make this happen? I'm not even sure if a formal discussion really needs to occur -- maybe it's just enough that we can all take a pledge to read this book in October? So, I'd love to hear your thoughts -- are you in? Any ideas on how to engage with each other? And if you've already read this book, are we in for a real gem of a read? I loved The Book Thief! It was an excellent read! My Dr. was just telling me yesterday how great this book it, and its on my list to start next! I'm not sure of the best way to engage a book club, outside of just a pledge - or maybe a badge. I have read The Book Thief though and cannot recommend it enough. It's a beautifully sad story. I'd love this. I haven't read the book, but it sounds interesting. I used to belong to a girls group and loved getting together for books and wine. I love this idea! What if each month anyone reading about the book posted their thoughts on the same day (ie: 3rd Tuesday of each month) and we had a linkup and badge for anyone who wanted to join? I was in a book club that disbanded so I'd love to join another one! I loved this book! And I would love to participate in whatever form you come up with for a virtual book club. Definitely count me in! Great idea! I always wanted to do something like this but didn't know how! I LOVED the Book Thief!! One of my all time favorite books, I love the writing. Of course the movie isn't nearly as good but still worth a watch! I'm in! I've heard amazing things about this one and it's been on my list for a while now. This will finally encourage me to read it! Love this idea!! I'm in :)! I miss reading SO badly. That is one thing that I have let go by the wayside since having Vivi and would love a reason to get back to it! What date would we need to start reading? I will make it a goal to participate! I am totally intrigued about this book! I have not heard of it before! Another book to add to the book club is "Me Before You" by Jojo Moyes. By far my favorite book I had read in the past year or so!! i sooooo need to ditch my political autobiographies and this seems like a great book! so...i'm in! first, i think a link up once a month is a great idea, and it should have a button for sure! doing a little review of the section of the book read seems like the natural thing to do. there could also be a Facebook group for internal discussion. such a good idea, liz! let me know if i can help get everything set up! I'm always looking for a good book, I'd love to participate! Do you use Goodreads? 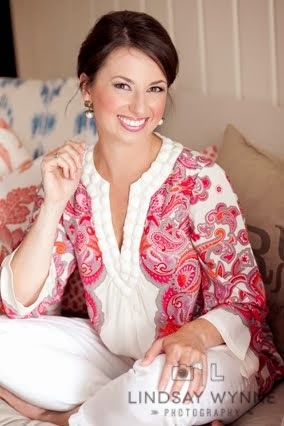 The site is a great to create book club groups and provides easy check-ins. This is terrific!! I'd love to join whatever effort you put together for this. Whether it's just a pledge or online chat about the book. I'm kinda like Jess Scott who said reading can be like working out. Hard to find the time, but this will motivate me. I'll go pickup my book this weekend. i seriously loved this book to death!! love this idea.